Goggles: You can't ride if you can't see. Josh over at Highly Obsessed posted up an entry on goggles which inspired me to write this one. I've written the advice below more times than I can count in various emails and snowboarding related forums so here we go once more (next time I'll just link to this post). As with boots, goggles are totally about fit. Forget style, this is one piece of equipment you really want to choose function over form. Fortunately most goggles out there look pretty good so you shouldn't have that much of an issue finding one that fits your face snugly (unless you don't live nearby a shop that carries a wide selection) and looks good. Before I go onto the various brands and their characteristics, Josh is absolutely correct regarding lens type. For flat or low light (cloudy or night riding) you'll want clear or high-intensity yellow lenses. Rose and amber lenses, though not as great in low light can be used in almost all conditions. For bluebird or sunny days, you'll want to go with darker colored lenses and getting a pair with some reflective coating will also help (ionized, iridium or whatever type of metallic coating they give the lens to filter out the sun and reduce glare). I know plenty of snowboarders that just call it a day after finding some cool mirror lens but that's totally not the way to go. I'd rather rock anything but a mirror lens for all around conditions. As for fit, most Asians have an issue since the lack of a pronounced nose bridge usually leaves a gap between the goggle and the face. Definitely a no-no, no matter how cool the goggles might look. I found that IS Eyewear (Type-R frame) goggles and Dragon (Mace, DX) goggles seem to have the best fit for Asians. Oakley's aren't bad, I wore the Wisdoms for a while but there was still a tiny gap that bothered me. Spy, Smith and Adidas goggles all have gaps. Also of note, Dragon, Oakley and Smith all produce 'Asian-fit' goggles for the Japanese market, so if you can import one, that may help. I really loved the Smith I/O goggles but since their regular version didn't fit well, I called them up about getting my hands on an Asian-fit goggle. Absolutely no help. 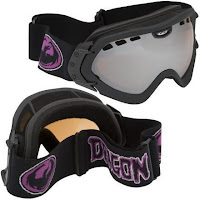 They stated that those goggles were only available in Asia and they wouldn't be able to ship any over here... tough eh? Talk about trying to make a sale. Nonexistant. Help your fellow riders out by posting what goggles you rock and what you like or hate about them!